Q:What are the side effects of Radiation Therapy? Radiation Therapy causes destruction of cells in the field of radiation and causes reduced blood supply to the area of the bone. When teeth are extracted or when surgeries involving bone are done then there is a very high risk of Osteoradionecrosis of Jaw to occur. Q:I am on Radiation Therapy for Head and Neck Cancer What are my options for Extractions of Teeth or surgeries involving Bone? If your radiation treatment has involved the head and neck area and if you are getting any teeth extracted or any surgery involving your bones in the head and neck region then you need Hyperbaric Oxygen Therapy which involves 20 dives before the surgery and 10 dives after the surgery. Q:I have history of radiation therapy in other area not involving Head and Neck area do I still need Hyperbaric Oxygen? No you will not be needing Hyperbaric Oxygen therapy if your teeth and Bone are not in the area of radiation Therapy. Q:Why should I get Hyperbaric oxygen for my Teeth extractions or surgeries involving bone? Hyperbaric oxygen helps in angiogenesis (means new blood supply ) to the area where radiation was received and decreases risk of Osteoradionecrosis of Jaw when teeth are extracted or osseous surgeries are performed. Q:If I undergo Hyperbaric Oxygen Therapy can Osteonecrosis of Jaw occur? 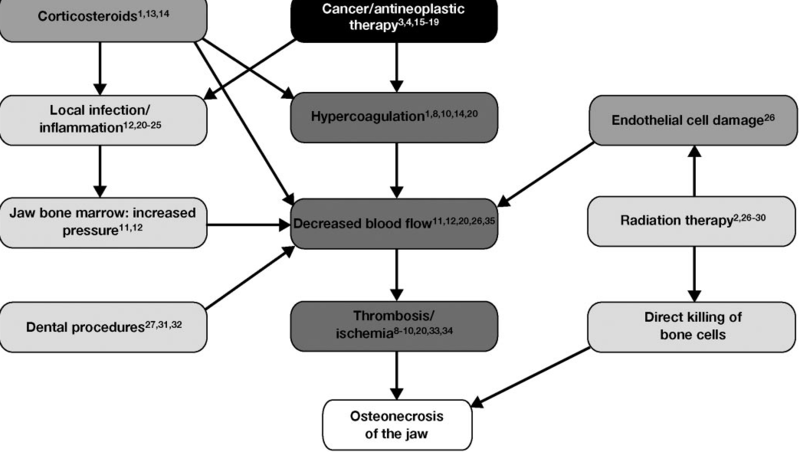 There is not enough literature to prove that with Hyperbaric Oxygen therapy Osteonecrosis of Jaw can be completely prevented. But however the Hyperbaric oxygen protocol has been recommended by ADA and American Association Oral and Maxillofacial Surgeons.